Diabetes can lead to foot ulcers that patients don’t feel or notice until it’s too late. Because they can’t heal on their own, 14 to 24 percent of diabetics in the US who get ulcers end up losing toes, a foot, or a leg. “We typically treat ulcers by removing devitalized tissue from the surface of the wound, and by helping the patient to find ways to take the weight off the affected foot,” says Desmond Bell, a podiatrist in wound management and amputation prevention at the Memorial Hospital in Jacksonville, Florida, and the founder of the Save a Leg, Save a Life Foundation. “The gold standard for treating an ulcer is a patient wearing a total-contact cast, which provides a protective environment for the foot. If we could test how well this insole delivers oxygen to the wound site from within the cast, then this could be a way of aiding the healing process,” Bell says. 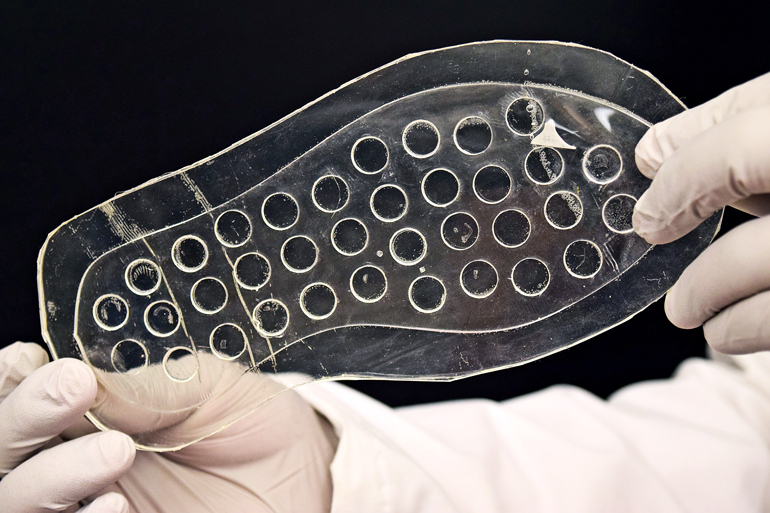 As reported in Materials Research Society Communications, researchers used lasers to shape silicone-based rubber into insoles, and then create reservoirs that release oxygen only at the part of the foot where the ulcer is located. Simulations show the insole can deliver oxygen at least eight hours a day under the pressure of someone weighing about 53-81 kilograms (117-179 pounds). But the insole can be customized to take on any weight, the researchers say. “This is mass-customization at low cost,” says Vaibhav Jain, a recent graduate from Purdue’s mechanical engineering master’s program and a current research associate in electrical and computer engineering. “We’re wanting to bring this technology to the user by addressing whichever technicalities would be required to simplify the manufacturing flow,” Jain says. A patent is pending on the insole technology and the team is currently seeking corporate partners. The NextFlex PC 1.0 Project funded the work.